This is my initiation post, so I thought it would be fitting to share a couple of things about myself. First of all, I really like eating healthy. I love working out and running and eating well because it makes me feel good. Second, I REALLY love chocolate. Especially DARK chocolate. Almost anything with chocolate in it is irresistible to me. I think most of my teeth are sweet teeth. You may think these two loves are contradictory. For a long time, I did too. But do they have to be??? I’ve recently been learning a lot about nutrition from my boyfriend, Tim. He’s a personal trainer who is way more committed to eating healthy than any sane person should be. But, he showed me that one of the keys to a healthy diet is making sure you get enough of the “good” fats. WHAAAAAAT??? There are good fats!?!? Good fats are like a fun little diet cheat code. There are even some diets that require you to eat a tablespoon of oil twice a day… it’s pretty gross, don’t try it. 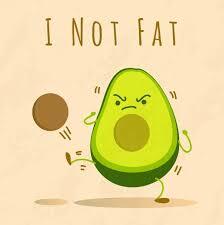 Anyway, healthy fat is found in things like avocados, coconut oil, olives, and nuts. I think fat gets a bad rap because of it’s unfortunate name. But, contrary to popular belief, fat doesn’t make you fat! When used in moderation, it can actually aid in weight loss! Maybe we should rename it “phat” so people will think it’s cool again. Really the only two things you need to be cautious about is making sure it’s the right kind of fat (not the grease dripping off your pizza, unfortunately), and to regulate the amount (because it is calorie dense, but still crucial to a healthy diet). So, one day I remembered this recipe from my good friend, Mr. Fleisher. 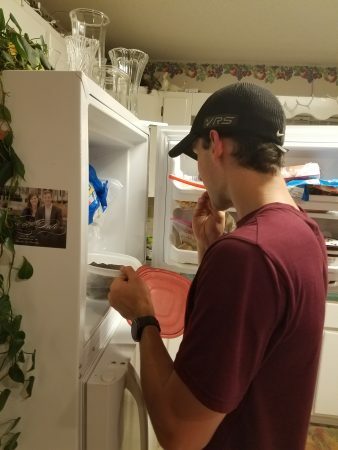 Back when I was in college, he would make me this heavenly freezer chocolate. The only ingredients are coconut oil, cocoa powder (antioxidants), and a little bit of honey! It occurred to me… that fits my macros! It’s a great way to get healthy fat in my diet AND curb my abundant chocolate cravings! Between my brother and me, chocolate doesn’t last long at our house. Before I give you the map to paradise (aka, the recipe), just a few things. You can easily change the sweetness by adjusting the honey. It won’t effect the chocolate setting up. If you like it dark, add less honey. 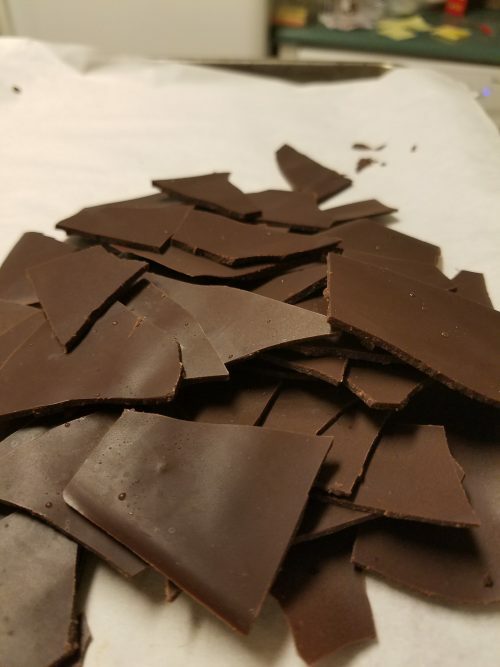 If you don’t like bitter chocolate, add more! — it’s that simple. 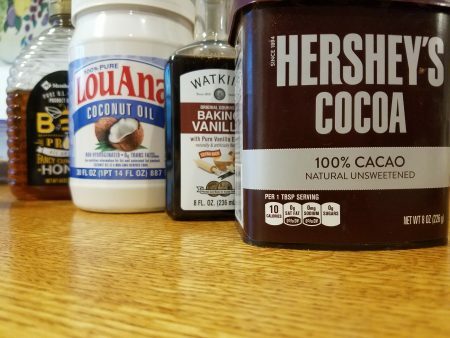 I usually make a 1-1-0.25 ratio of coconut oil, cocoa powder, and honey. That is sweet enough for most dark chocolate lovers. However, I believe the original recipe was a 1-1-1 ratio (very sweet). If you aren’t sure where you fall, I would recommend making a smallish amount the first time for a taste test. The second thing is that you can get creative with the flavorings! It’s fun to add sliced almonds or chopped pecans, and you don’t have to use boring old vanilla. If you want to get really crazy, there are a plethora of flavors to choose from! Orange, Baileys, Jack, caramel… just use your imagination. Finally, I would LOVE to see someone try this recipe in a cute little mold! Someday I’m going to grow up, get fancy, and invest in some nice molds, but for now I’ll eat chocolate no matter what shape it’s in. However, if you are one of those “Pinterest Perfect” people that I envy, PLEASE send a picture or leave a comment of the mold you use! I know you’ll enjoy this recipe as much as I have! A delightful not-too-sweet treat to always keep on hand. Line two sheet pans with wax paper or parchment. Melt the coconut oil over low heat just until almost melted. Whisk the honey into the coconut oil for about a minute until the honey is warm and all the coconut oil is melted and well mixed. Take off heat [if it gets too hot it will get grainy (seize)]. Whisk in the cocoa powder and vanilla. 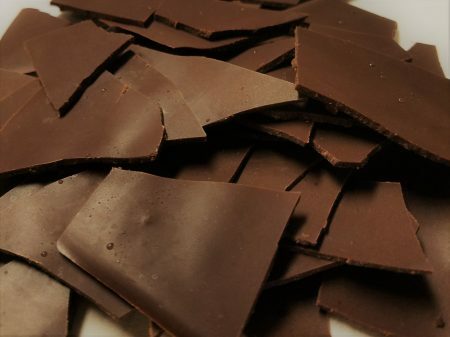 Pour chocolate onto the prepared sheet to evenly distribute into a thin sheet. 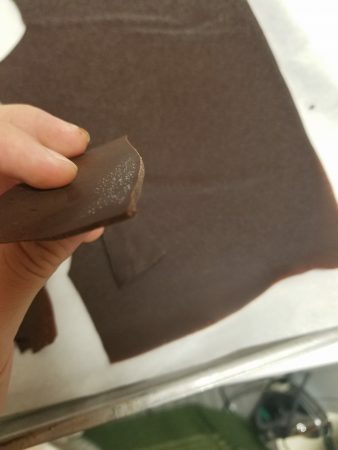 Freeze on a level shelf until the chocolate is set. 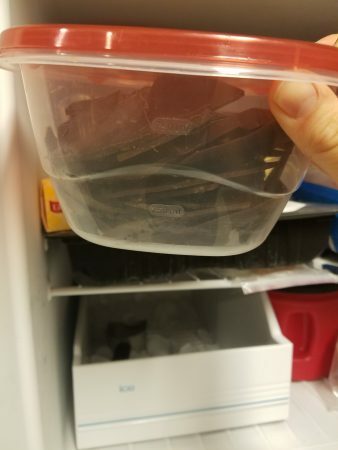 Break into pieces and store in a sealed container in the freezer. Also works well in cute little molds, but I really like the texture and melt-in-your-mouth effect of the thin chips. 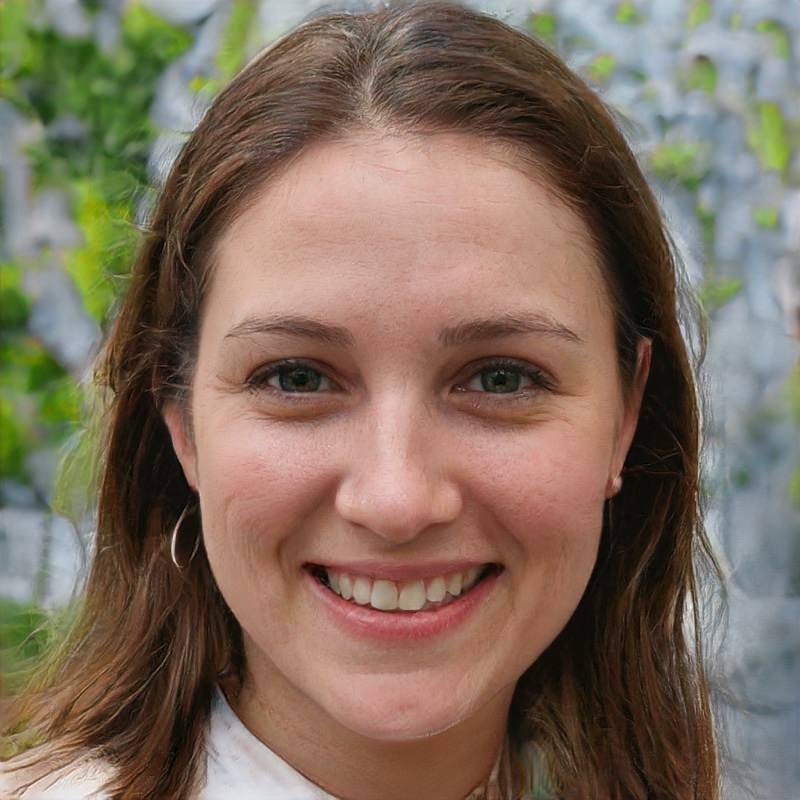 Terri, when you have a chance to give it a try please let us know what you think!